Astrology has always been an interesting subject for me. The mystical world of occult science have always created some kind of intrigue within me. It is this interest that have led me to move ahead in life and explore the various facets of Astrology. My passion in Astrology have always been the guiding force that compelled me to take up Astrology as a career, as the subject never tires me and the endless research it provides always keeps providing new insights that encourages me to research furthermore. My first hand expertise lies in match making and vastu recommendation. Over the years I have given various consultations on Vastu recommendations and match making. And most of the clients have been satisfied with the remedies and solutions that I have provided. I have served more than 500 families by helping them find the perfect match for their children, sisters, brothers, uncles, aunts, etc. And most of the couples have turned out to be the perfect match for each other. I have also recommended Vastu changes in the homes and offices of hundreds and thousands of people to improve their life and business – with better relationships, health, career and success. My advice has helped people achieve their goals. Many businessmen and working professionals have contacted me for solutions and remedies to ensure harmony among their staff and also to increase their productivity. I started practicing astrology at a very young age. 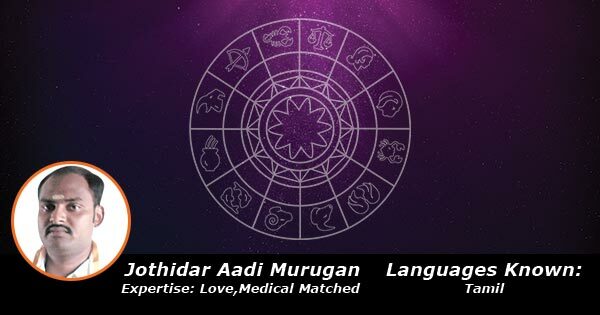 With 15 years working experience in Astrology service, I had worked 10 year’s in World Phone as a consultant astrologer, Ever since I joined the call center, my career in astrology got a boost as I get to interact hundreds of new clients every day. My communication skills improved to a great extent and I must admit the fact that every day is a new day full of challenges which drives me to do my best. Whenever I give telephonic consultations to my clients, I ensure that my clients get full clarity about the resolutions I provide them and a proper understanding of their horoscope so that it helps them in overcoming their faulty beliefs and blind faiths.